Microsoft and Nintendo have officially opened the doors to cross-play. It started with the announcement of Fortnite on Nintendo Switch last week and now continues with Minecraft thanks to a large update that just became available. 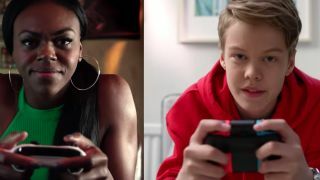 Nintendo has released an official trailer commemorating the monumental occasion, and it’s glorious in both its inclusiveness and the way it subtly digs at Sony for not being part of the partnership. The latter is important because Sony does not allow a Fortnite account that was linked on a Switch or Xbox One to be used on PS4 - meaning all the items you’ve bought and paid for elsewhere can’t be used on the PS4 version of the game - nor does it allow cross-play for games like Minecraft or Rocket League, both of which exist on other platforms where cross-play is available. The trailer Nintendo released today seems to fly in the face of those self-imposed limitations, showing that not only is cross-play between two rival consoles (in this case, Xbox One S and Nintendo Switch) possible, it’s encouraged.